Vikings general manager Rick Spielman has drawn criticism from Vikings fans of late, due to his perceived mismanagement of the team's personnel at the quarterback position. Wins in two of the last three games with Matt Cassel at quarterback have changed the direction of ire for the fans and placed the crosshairs on Minnesota Vikings general manager Rick Spielman. Answer: Cassel’s success the past three weeks in place of Christian Ponder has definitely added to the belief this season could have gone much differently for Minnesota. I’ve said for most of the season I believed Cassel gives the Vikings the best chance to win, and he proved it repeatedly. Yet, Minnesota still had to see if its investment in Ponder could pay off. Coming into the season with Ponder as the starter made sense after his strong finish last year. Adding Cassel, a veteran, experienced backup was a good move. Yet, once Ponder again had inconsistency — and injuries as well — the Vikings would have been better off playing Cassel while there was still a glimmer of hope for the season. Ponder struggled in the seasons’ first three games in getting another chance as the starter and then was out with a fractured rib. Cassel entered and immediately showed the difference between a poised quarterback and Ponder’s hesitancy. I believe the team went back to Ponder during the middle part of the season after one failed game from Josh Freeman to see if they could salvage anything from Ponder, their 2011 first-round draft pick. 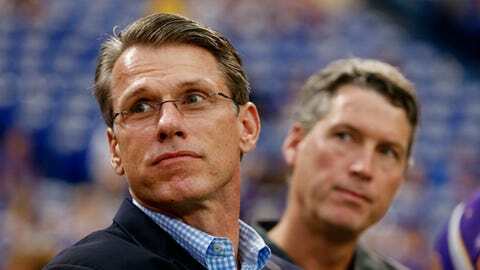 The sense I receive is general manager Rick Spielman might have been behind the decision. Once Ponder again showed inconsistency — and got injured again — the team had decided to move on and go with Cassel. While people are questioning Spielman now, I don’t believe he is going to lose his job as general manager. The question becomes whether Spielman and his personnel staff can properly evaluate the quarterback position. Coaches and players this season, particularly Dallas’s Jason Garrett and Tony Romo, have talked about how only certain people are able to evaluate quarterbacks properly. Spielman will again be making the decision after Ponder didn’t work out and the jury is still out on whether they know what to look for. A: At this point, I foresee the Vikings going after a quarterback in the first round. Depending on other moves in the offseason, either bringing back Matt Cassel, or making a trade, Minnesota could go elsewhere in the first round. But to secure a franchise-level quarterback, the Vikings will need to look early in the draft. There are few exceptions, but the league’s top quarterbacks usually come from the top of the draft. Minnesota shouldn’t feel pressured into reaching for a first-round quarterback, though. If a franchise quarterback isn’t available, the Vikings would be better off addressing another position rather than feeling forced into addressing the position. Minnesota needs to find a solution at the game’s most important position. Spielman and company can’t afford to miss, either. A: Frankly, too many people have been hung up on the money paid to Freeman this season. Adding Freeman didn’t keep Minnesota from bringing in any other help. Overall, the money being paid to quarterbacks isn’t much by the Vikings compared to other teams in the NFL. Cassel is actually the team’s highest-paid quarterback. Bringing in Freeman was a worthy gamble. Freeman was once considered a franchise quarterback. He’s tall, mobile and has a strong arm and some believe he has the skills to be a starting NFL quarterback. Getting the chance to work with Freeman on an every-day basis made the investment by Minnesota worth it. If they would have stumbled on a franchise quarterback, everyone would have trumpeted the move. But the Vikings got the chance to see Freeman, work with him on the field and in the meeting rooms and were able to evaluate whether he indeed has a chance to be a franchise quarterback. Minnesota has probably seen exactly what it needed to see, instead of making a leap in the offseason when it would have been more expensive. A: Audie Cole has played well since getting the chance to replace Erin Henderson at middle linebacker. Cole isn’t playing at a Pro Bowl level, but has made plays and been consistent. He’s been a steady tackler and, most importantly, has been better than Henderson in coverage. Pro Football Focus has given Cole a positive grade this season. Based on a plus-3.5 grade in coverage, Cole has been graded out by Pro Football Focus as a 0.5. Henderson is a minus-5.8 and a minus-7.1 in coverage. Shifting Henderson back to the weakside also helps Minnesota in the base defense, by Henderson returning to his usual position and providing an upgrade. The Vikings didn’t change defensive assignments with Cole in the middle and Henderson on the weakside. Cole stays on in the nickel defense with his success in coverage. Minnesota has also used more man defense in recent weeks, but its been based on the play of the cornerbacks and not the linebackers. A: Asiata’s game Sunday was a good complement to the passing game by Cassel. The "huge" portion of Asiata’s game was the three touchdowns, but they were all short-yardage, goal-line attempts. The Vikings tried to stick to their basic schemes with the running game and nothing should change when Adrian Peterson returns this week. Asiata had 51 yards on 30 carries. Peterson is the league’s best back and nothing Asiata did on Sunday will change Minnesota’s structure in the running game. Trading Ponder could be an option. He has another year left on his contract, so don’t be surprised if he returns next season in a reserve role. There’s no need to "re-up" Cassel’s contract. He’s signed through next season and is due $3.7 million next year. However, Cassel holds a player option and can opt out of the contract if he desires. Getting the chance to start now could maybe lead to Cassel returning next year. A: If you’ve read my mailbag this season, you know I believe Frazier has the temperament and respect to be a good NFL head coach. I’ve also mentioned Frazier would benefit from strong coordinators, tacticians on both sides of the ball. Frazier does have support in the locker room, and this season has been an example. Despite a lost season and several occasions that could have been questioned, there has been no in-fighting this season and Minnesota has remained competitive. I’m not sure if firing the coordinators will be enough to save Frazier’s job. I’m not certain, as some are, that Frazier will definitely be fired. Frazier is loyal, but I’m not sure the Ponder-Cassel-Freeman decisions were solely in his hands. The decision-making on the quarterback position could well decide whether Frazier is jettisoned or not. If Spielman was forcing Ponder on Frazier, is it fair Frazier is fired for the ineptitude at quarterback? There were reports this weekend of Frazier likely being fired and Minnesota had checked in on Penn State coach Bill O’Brien. At this point, I don’t know enough about O’Brien and whether he would leave his job to return to the NFL. O’Brien has been Penn State’s coach the past two seasons. Previously he was with the New England Patriots for five seasons, which culminated in being the offensive coordinator and quarterbacks coach his final season with New England in 2011. A: Compared to his standout rookie season, Blair Walsh hasn’t been as crisp this season. He did deal with a hamstring injury earlier this season. Walsh connected on 35 of his 38 field-goal attempts last season and was 10 of 10 from 50 yards or more. This season, he is 26 of 30 and 2 of 5 from 50 yards or more. Walsh was third in the league last year in touchback percentage of kickoffs, at 61.6 percent. This season, Walsh has touchbacks on 50 percent of his kickoffs. The injury might have set him back earlier, but Walsh and special teams coordinator Mike Priefer have said he wasn’t bothered much by the injury and got over the injury quickly. Walsh also missed a point-after attempt this season. Walsh is still one of the league’s better kickers and one of the more consistent, but he hasn’t had the same success as last year. Thank you for your submissions. Sorry we’re not able to answer each question individually. I’ve tried to hit as many different topics as possible. I hope we continue to hear from you in the future. Be sure to check FOXSportsNorth.com for upcoming mailbags.